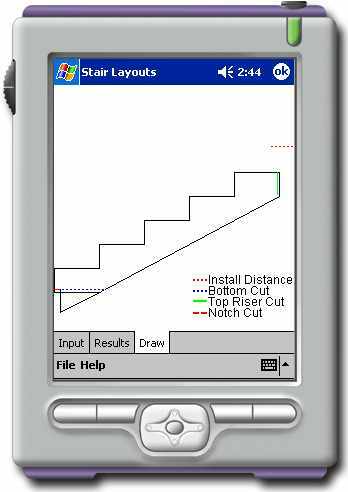 The Pocket PC 2002 edition of the Stair Layout tool offers nearly all the capabilities of the desktop version to allow you to completely specify the layout of stair stringers. 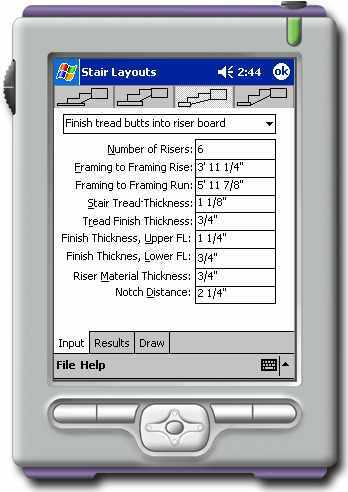 Stair stringers can be difficult to calculate---it's not just a matter of dividing risers into the total rise. Any given rise on a set of stairs has to be very close to all other risers in order to meet code. The complications relate to how the stairs meet different landings, notches, tread, upper and lower floor finishes, framing details, etc. There are a lot of variables to keep track of in order to build a set of stairs correctly. A framing sub-contractor that purchased MasterCarpenter years ago informed us that of the 30 people working for him he was the only one who could correctly calculate a set of stairs when the more difficult variables were involved. 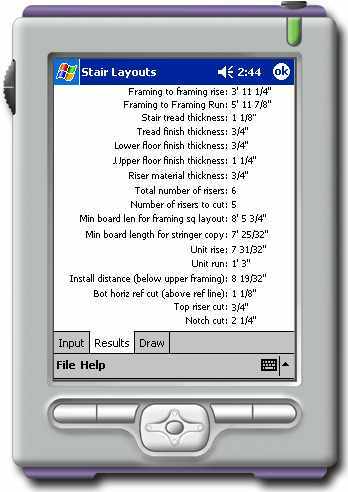 The Stair Layout tool makes laying out the most difficult stairs simple. Included with the online documentation and printable manual is an introduction to stair framing (including open stairways) as well as examples of usage.